If you do not remember Isabella d’Este from history books, you might remember her from Judy Chicago’s iconic installation The Dinner Party, where d’Este was given her own place setting! In the sixteenth century, Isabelle d’Este (1474–1539) was termed the First Lady of the Renaissance. Born into the ruling family of Ferrara, d’Este had parents who were preoccupied with their children’s education—including that of their daughters. By the time she was 16 years old, Isabella could converse in Greek and Latin, discuss politics, and play musical instruments. Also by age 16, she was married to Francesco Gonzaga, Marquis of Mantua. 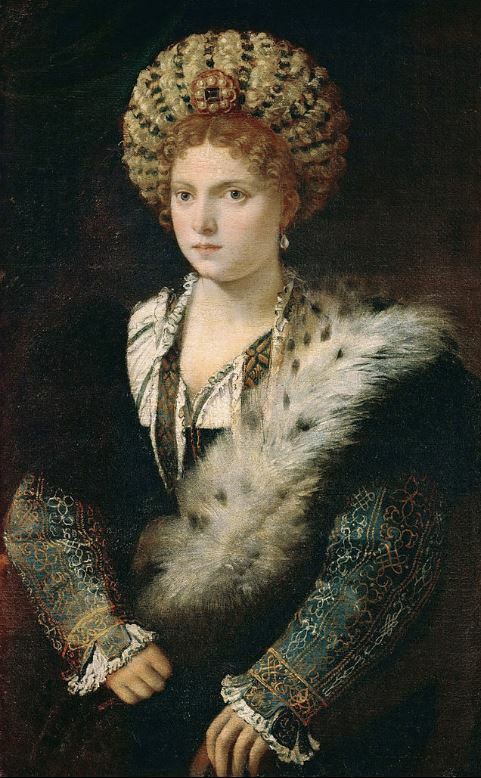 As the Marchesa of Mantua, d’Este began building her place as a powerful patron of art. More than just an exceptional woman, Isabella d’Este impacted the way art is displayed at museums and collections to this day. The next time you’re visiting a museum, think of her—why? Because, as San Juan describes, she was the first collector to dedicate select private rooms and display cases to the exhibition of her collection. —Shannon Weiss is the publications and marketing/communications intern at the National Museum of Women in the Arts. This blog post continues our series on women collectors throughout history—read about Catherine the Great. 1. Sheryl E. Reiss, “Beyond Isabella and Beyond: Secular Women Patrons of Art in Early Modern Europe,” in The Ashgate Research Companion to Women and Gender in Early Modern Europe: 446. 2. Susan Bracken, Andrea M Gáldy, and Adriana Turpin, editors, Women Patrons and Collectors: xxiv. This entry was posted in Library and Research Center by Women in the arts. Bookmark the permalink.